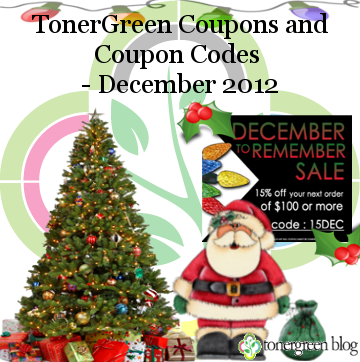 TonerGreen Coupons and Coupon Codes - December 2012 | TonerGreen - Eco-Friendly Toners from the U.S.
December is here and so is Christmas! I know some of you are starting to decorate your houses or offices with Christmas decorations or already putting up Christmas tree. I would even take a bet that there are people who already started their Christmas shopping last Black Friday and Cyber Monday. Well, that isn't a big surprise, who wouldn't grab any discounts and promos to save this coming holiday? A December to Remember Sale - Save 15% off on all orders of ink cartridges or toner cartridges $100 plus free-shipping. Use coupon code 15DEC. This early Christmas treat ends on December 9. A December to Remember Sale is also not valid on any OEM products and cannot be combined with other on-going promotions or coupon codes. Free Shipping - TonerGreen offers free-shipping on orders amounting $50 or more without any coupon code required.